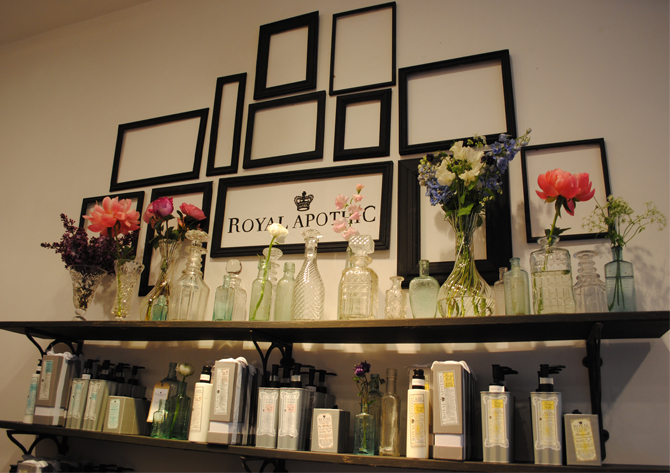 Just launched at Anthropologie in the Kings Road is Royal Apothic, a Los Angeles/London based perfume and beauty brand founded by the effervescent Sean O’Mara and it’s rather lovely. Finding a well priced perfume that is a quality smell and a little bit under-the-radar (so not everyone is wearing it) is a bit tricky and Royal Apothic ticks those boxes AND it comes in great packaging. 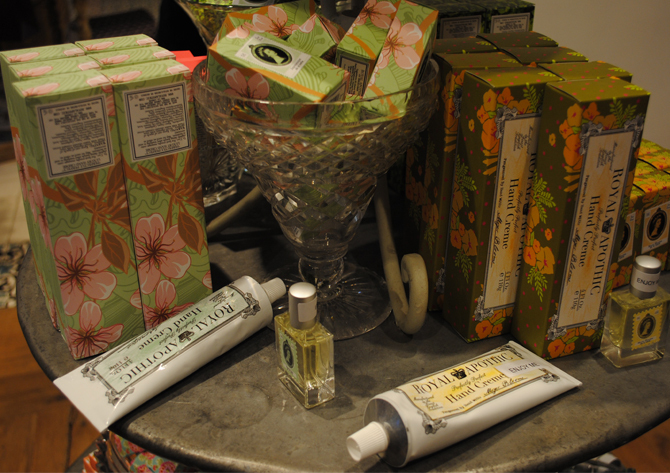 The brand is being sold in the pop-up gallery space in the Anthro’ store, which has been styled like an old fashioned apothecary for the duration. 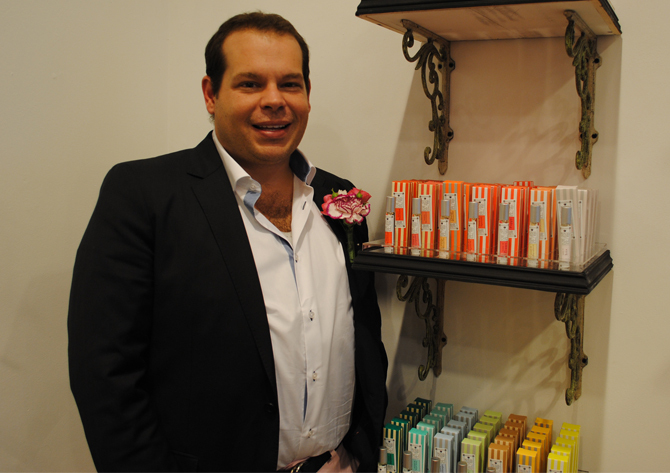 At the launch party we pinned Sean into a corner and quizzed him on the new bespoke perfume he’s created for Anthropologie -Antiquarius Petals -and found out a bit more about the brand. How did he start up Royal Apothic? “I was mooching around waiting for a sign as to what to do next’, he told us ‘when I found an amazing perfume apothecary book on an antique stall at Notting Hill Market and that was it, I decided I was going to move into perfume’. 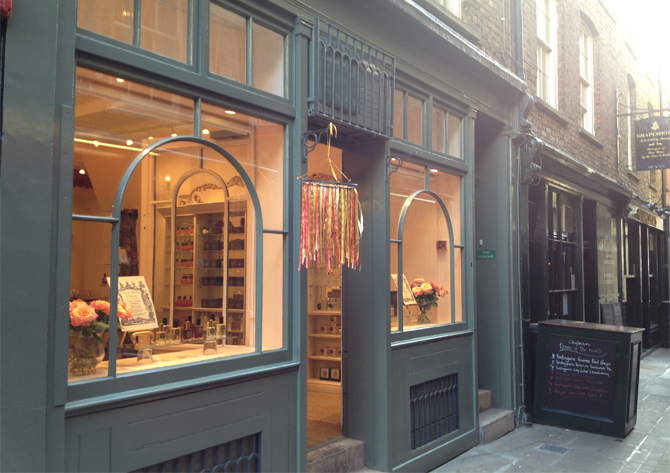 Sean works between London and Los Angeles and although in the US the brand is very successful, Anthropologie is his first UK proper stockist, (although I notice it’s also on the Space NK website) which is really surprising since it looks a winner to me. I have been wearing the Antiquarius Petal, (£26) so named because the Kings Road Anthro’ used to be the home of the much missed Antiquarius Antiques, and it’s fresh, flowery and pretty, really easy to wear. The bottle also has that cute retro perfume-puffer on it which makes me feel a bit Daisy Buchanan-ish. 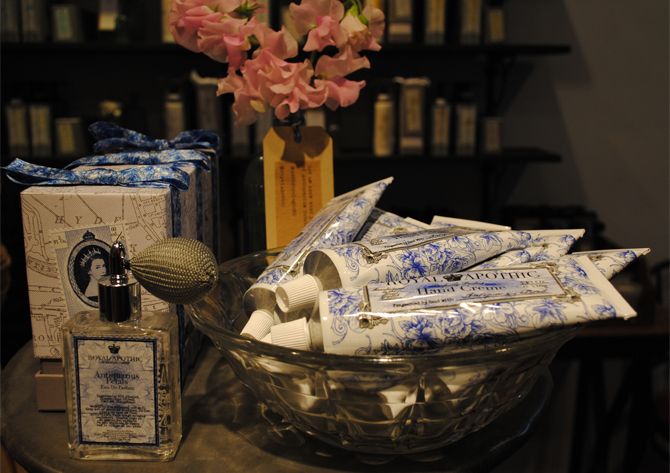 Apparently things went a little mad in the US recently when Victoria Beckham tweeted that the Holland Park hand cream was her favourite, bought from her local LA Anthro when she lived there. It is very good. 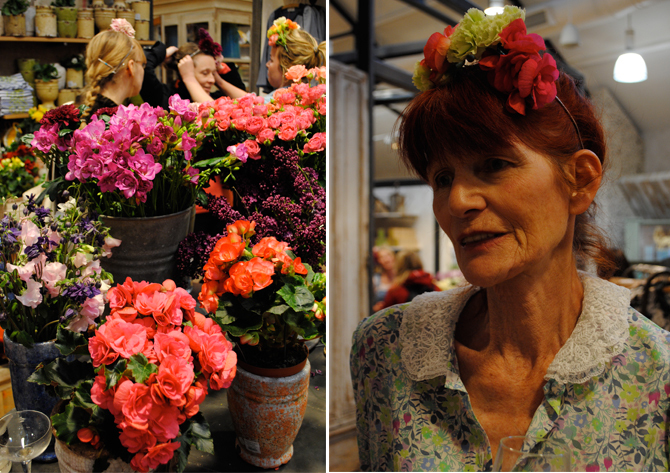 To celebrate the opening, which deliberately coincided with Chelsea Flower Show this week, the talented Flower Appreciation Society girls were on hand to create floral crowns. 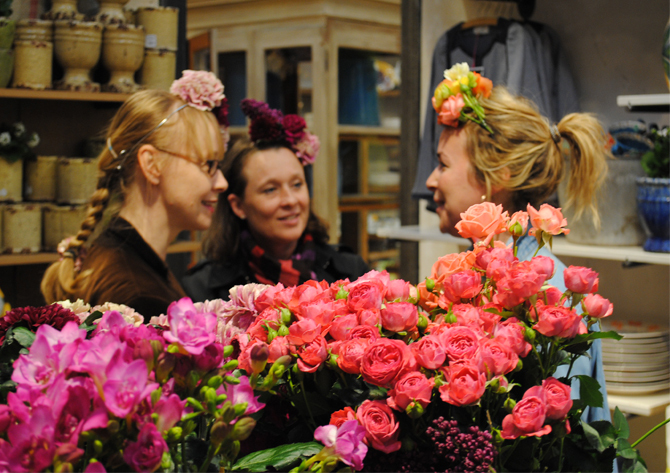 There’s nothing like a floral crown to lift the spirits and they made the store look so pretty. 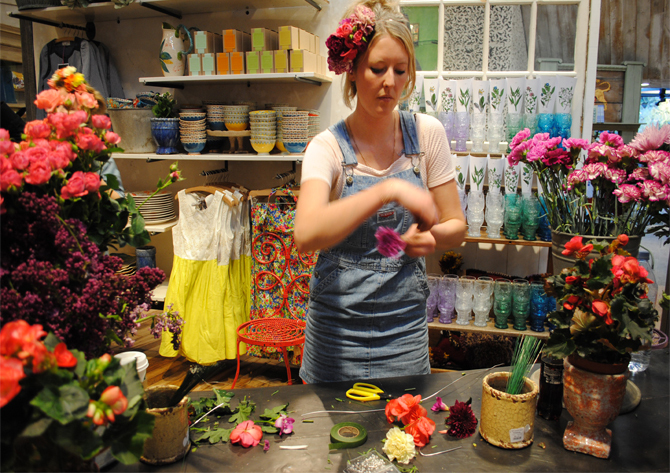 I think this is Ellie from the Flower Appreciation Society. She was amazingly fast at creating crowns. The eau de toilette is also available in mini-sizes (at £12) to slip into your handbag, I wish more fragrance houses would do this, I’m always getting messy decanting big bottles into Muiji plastic spray bottles for on-the-go spritzing. There’s a good range for men too, and I have it on good authority the lip balms -The Balmies – are worth trying. The pop up store is at Anthropologie Kings Road until June 30th, a small selection of products is available on the Anthro website here but for the full range, visit the store. Where’s your stores in London?